by Emelia Motsai and Mia Swart. THE Wits SRC held a protest today demanding that university management drop the charges brought against some of their members and other students. Eleven students, including nine SRC members were charged for possible contravention of the university’s code of conduct. The group was charged after disrupting a musical recital by Israeli-born pianist Yossi Reshef on March 12 as part of a protest during Israel Apartheid Week. “Today’s protest was about mobilising students to stand in solidarity with those who have been charged,” said SRC Treasurer, Justice Nkomo. “We have asked them [Wits management] to drop the charges and they blatantly said: No! We must account for our actions.” said SRC secretary Tasneem Essop. Billy Sepuru, provincial secretary of South African Students Congress (SASCO), said charges against the SRC were “illegal, immoral and disgusting”. “We pledge solidarity with the Wits SRC,” he said. Sepuru said if the charges were not dropped, SASCO would “mobilise the whole province and they will come to Wits and close Wits down”. He said that “students must come out in protection of the SRC they voted for”. “The democracy of South Africa is not complete until the people of Palestine have theirs,” said Sepuru. 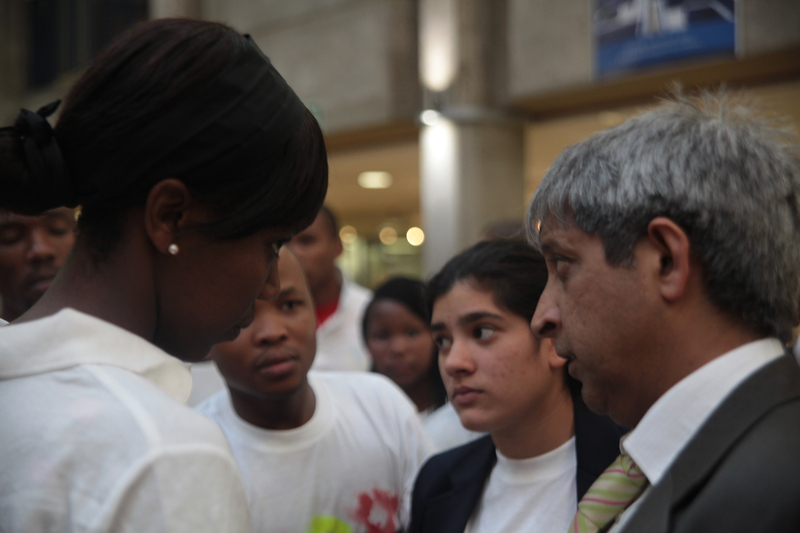 About 50 people took part in the protest which started at the Matrix and then moved to Sanete House to speak to incoming vice chancellor Adam Habib. According to SRC secretary Tasneem Essop the people present were PYA members and general supporters of the SRC. The group sang struggle songs and chanted “long live Wits SRC long live” and “away with the reactionary management! 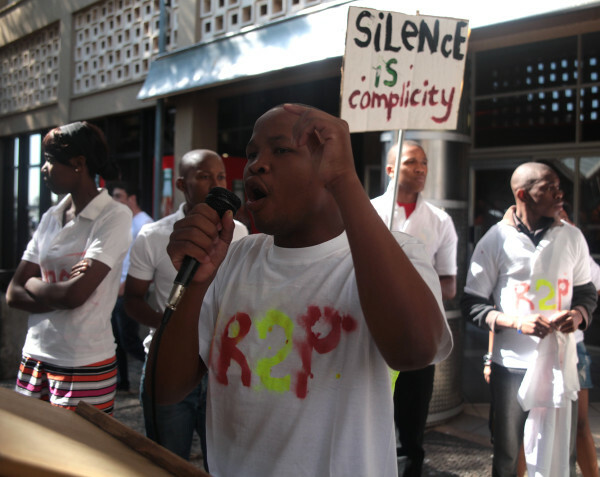 Away!” They waved placards with the words “It’s my r2p to protest for more parking” and “Silence is Complicity”. 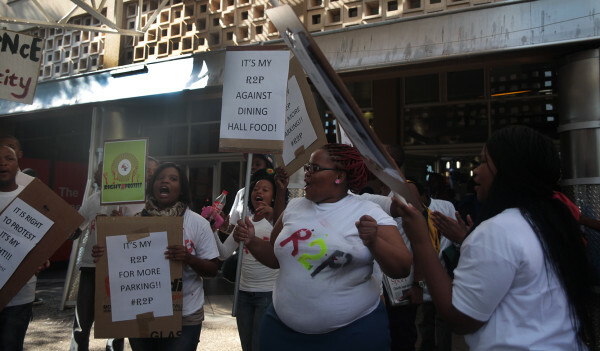 Nkomo said: “When food is rotten, it is our right to protest! When students pay but there is no parking, it’s our right to protest! When Palestine is being discriminated against, it’s our right to protest”. “The right to protest is guaranteed. What is in question is how. Do you intimidate, or do you violate others?” Habib said when the protesters met him at Senate House. SRC Vice President External Joy Phiri said to Habib “we are pleading with management to say please drop the charges against SRC. The SRC asked Habib to get back to them on Monday. Habib said neither he nor the outgoing Vice Chancellor Loyiso Nongxa will be in the country on Monday but Prof Tawana Kupe, Deputy Vice Chancellor for Finance and Operations will act on their behalf.